Sarcoptic mange occurs in coyotes and other mammals when a parasitic mite (Sarcoptes scabiei) burrows down into the skin and causes hair loss. Constant scratching compounds the problem and leads to open lesions and sores, thereby allowing infections to develop. Sadly, as the weather turns cold, the sick animal is unable to maintain its body temperature, its immune system becomes severely compromised, and death is usually inevitable. 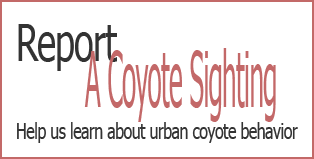 Recent studies of urban coyotes in Edmonton, Alberta have shown an association between poor health (including mange) and the consumption of anthropogenic (human sourced) food (Murray et al., 2015). This means that coyotes with mange tend to become progressively more desperate and have a greater likelihood to come into conflict with humans and their pets. We have seen evidence of a similar pattern here in Atlanta. This video begins with a young coyote in the early stages of mange. Note the loss of fur, particularly on its tail. One or two of its siblings look like they are also showing symptoms. Next you’ll see a coyote with mange that has come up on to a porch looking for food, then a red fox with more severe symptoms that has done likewise, and finally, a coyote that succumbed to the disease. We have not seen a high incidence of mange locally, but the parasite can be easily transmitted from one animal to another. As always, keep close tabs on your pets and don’t allow wild animals access to anthropogenic food.